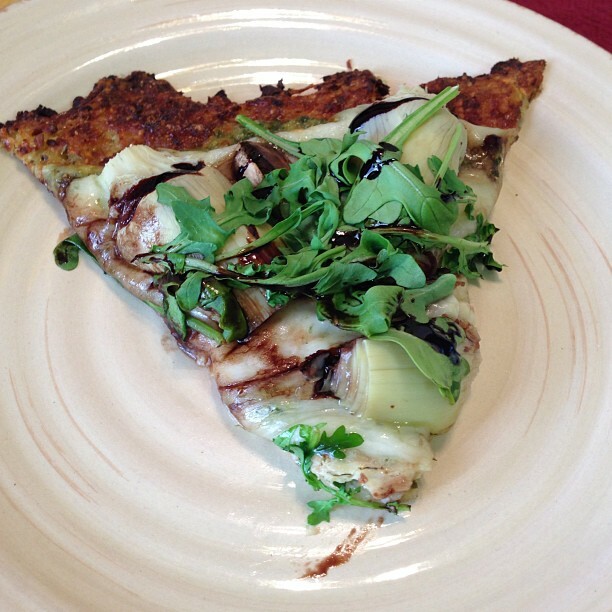 Cauliflower Pizza Crust with Pesto, Artichoke Hearts, Mushrooms, Arugula, and a drizzle of Balsamic Glaze. Back in August, one of my Facebook friends posted a picture of her cauliflower pizza crust. I thought that was interesting, so I searched some food blogs for recipes. I found one on Recipe Girl that had nice step-by-step pictures (despite the fact that she made a Hawaiian pizza...eww, pineapple! ), so I saved the link and emailed it to my sister Erin. I tend run new ideas by her before I actually tackle them. Well, in August we thought it was a good idea and now it's March. So, it took me 6 months to actually buy a head of cauliflower, but I guess that's what a day off is for! Side note: speaking of my day off, let's recap the last few months, shall we? After Thanksgiving, I quit my job at the career college to go back to the uncertain world of school counseling. I missed it so much and I was miserable at the college. A friend was going on maternity leave and needed a substitute while she was gone. I was perfect for the job. I started working at Marshall Middle School on December 5th. That long-term position ended on Valentine's Day. It was one of the most incredible schools I've ever worked at. The kids were amazing and I miss lunch supervision with my 6th grade boys!! The administration is phenomenal. The principal and the counselors there are my professional heroes and mentors. I want to be these women someday. Anyway, I am in between sub jobs at the moment, which is how I have a day off. I'll start my next job on March 8th, subbing as a counselor at De Portola Middle School. I can't wait! Awesome. You are caught up on my work life now and understand how I have a day off. Let's continue with the cauliflower. I was in the mood to cook something new and blog about it, so I decided it was time to actually make the cauliflower pizza crust. I had never really had cauliflower before. I skipped it at salad bars and avoided it in mixed vegetables. It just felt boring and unimportant to me, so I have had been hesitant to but a head of cauliflower in the first place. So, as I was preparing the cauliflower dough, I ate some of it raw. You know what? It's tasty. Why have I avoided this vegetable for so long? It reminded me of mashed potatoes, so I think it would be good roasted or steamed. I've been converted. So please feel free to share your cauliflower recipes with me! Now, I made a fancy pizza today because I was in a fancy mood. But I think this crust would lend well to any toppings. My next cauliflower pizza will have turkey pepperoni on it because that stuff is super tasty without all the fat and calories of the regular stuff. The cauliflower crust was just delicious. It definitely creates more of a "fork and knife" pizza than an "eat with your hands" pizza, but it was still great. I had to be creative and skillful in getting the pizza off of the pan in one piece, but I made it work. I used a metal spatula to loosen the pizza off the pan and then slid a thin, flexible cutting board in between the pizza and the pan to transfer it. Worked like a charm! I hope you enjoy this pizza! It's a clever way to sneak in an extra vegetable and a great way to go gluten free for a meal. Enjoy! Grate the cauliflower into small crumbles with a box grater. (You can use the food processor if you'd like, but you just want crumbles, not puree.) Place the cauliflower crumbles in a large bowl and microwave them (dry) for 8 minutes. Let cauliflower cool for about 5 minutes. Grating the cauliflower was SUPER easy!! This is half of the large head of cauliflower grated, about 3 cups before it went into the microwave. And this is after the microwave. A little less than 2 cups now. Preheat the oven to 450 degrees F. Spray a cookie sheet or pizza pan with nonstick spray (or use a nonstick surface). In a medium bowl, mix the cauliflower crumbles with the egg, cheese, oregano, minced garlic, onion powder, and salt until well combined. That's all that goes into this pizza dough! Incredible! Can you believe that this basically cauliflower and cheese?! Pat the dough into a 9 to 12-inch round on the prepared pan. Spray the crust lightly with nonstick spray and bake for 12-15 minutes or until golden brown. Remove the crust from the oven and turn the heat up to broil. It was a lot easier to pat into a round than I expected. The dough is easy to work with and didn't fall apart. Mine was deliciously golden brown after 12 minutes, so keep an eye on your crust! Then top with your favorite toppings! (See below for my creation.) Broil the pizza 3 to 4 minutes, or until the toppings are hot and the cheese is melted and bubbly. Cut into 6 slices and serve immediately. Spread the pesto sauce on top of the baked crust, leaving a ½-inch border around the edge. Sprinkle cheese on top and add the artichoke hearts and mushrooms. Broil the pizza 3 to 4 minutes, or until the toppings are hot and the cheese is melted and bubbly. Sprinkle arugula on top and drizzle balsamic glaze over arugula. Put back in the oven for 1 minute. Cut into 6 slices and serve immediately. All my toppings are on and ready to be broiled! This was after being broiled for about 4 minutes. Then I sprinkled on the arugula and drizzled on the balsamic glaze and put it back under the broiler for another minute. I love this. I am sending it to my celiac friend and bookmarking it for myself.